Michael Long was born May 3, 1814, in eastern Ohio. He became a Christian, and a UB, at a young age. 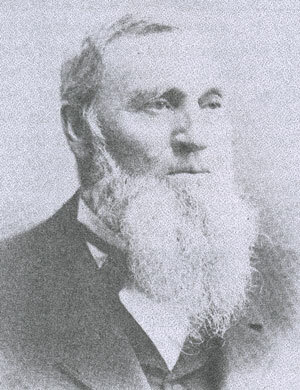 He was licensed to preach in 1836 by Sandusky Conference (northern Ohio) and was assigned to a circuit of churches—28 appointments which took 400 miles to cover (including nine crossings of the Auglaize River). He preached at each place once a month. At the time, there were no church buildings in the entire conference. Services were held in homes, barns, groves, and other places. Long spent his entire ministry, nearly 60 years, in the Great Black Swamp of northwestern Ohio. The Black Swamp was tough on preachers. There were few roads and bridges, and many ways to get sick. Where horses couldn’t travel, preachers had to trudge through the swamp on foot. Long was described as having a strong, “impressive” physique. His mighty voice was perfect for campmeetings, and he was a gifted singer, too. He was personable, cordial, with a “sunny disposition and a merry humor.”It was said that Long once preached three times a day for 30 days straight. He attended Sandusky Conference 56 years in a row, and never missed the opening prayer. Long and his wife Sarah were married in 1837 and had five children. All three sons became ministers. Sarah, three years younger than him, preceded him in death by two years.